Autumn always seems to time its arrival to coincide with that of the Book Festival, with the rain limiting opportunities for the simple pleasures of sitting in Charlotte Square Gardens with a book and some refreshment. However, there were plenty of opportunities for those interested in theatre to sit inside instead. The third of the Playing With Books collaborations with the Lyceum in the Spiegeltent was based on Mexican author Yuri Herrera’s Signs Preceding the End of the World, a novel about border crossings and translations that works on several levels. Signs Preceding the End of the World. Pic from And Other Stories Twitter. 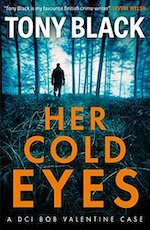 These events, both last year and this, have sometimes struck an odd balance between presenting a hastily worked-up version of a book and more general discussion about the process involved. Here, the performers – the authoritative Itxaso Moreno and the always impressive Owen Whitelaw – were tantalisingly under-used. What saved the sections where the others involved talked about creative decisions was their honest attitude. Adapter Linda McLean and director Finn den Hertog were almost painfully honest, while designer Camilla Clarke in many ways stole the show. It is unusual but heartening to see a designer involved in such an event, and Clarke – visual designer on Wind Resistance– may be something of a visionary. Certainly, her descriptions of a stage dominated by a massive borehole that then becomes a giant airborne washing-machine drum, and a wall of hydraulic-powered rippling stadium seating made of obsidian, made all present hopeful of a future production. Herrera himself talked eloquently about the power of books and the possibilities and dangers of translation. He also seemed perfectly happy for his work to be treated by others in whatever way they saw fit. Which is not necessarily something that could be said for Michael Frayn. Despite being probably best known as a playwright, and a big enough draw to pack out the extended Baillie Gifford Main Theatre, his relationship with theatre could best be described as uneasy. 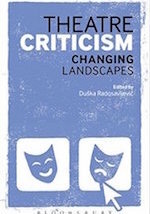 He admits that his earlier disdain for the stage was based largely on sour grapes after an unsuccessful Footlights revue, but he obviously still finds live theatre, with its possibilities for embarrassment from audiences, something of a strain. Frayn is a polished and practised festival attraction, but this does mean that the same anecdotes keep coming back. 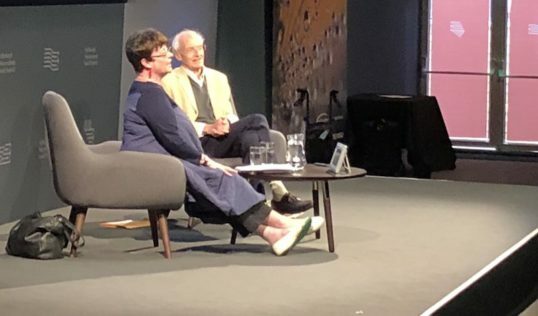 There was also a feeling of deja vu about chair Sheena McDonald dragging husband and Book Festival chair of directors Alan Little onstage to perform a couple of Frayn’s pocket playlets – something which they admittedly did with considerable charm. Despite stressing that the theatre is a collaborative medium, Frayn seems to have a dislike for director-led productions, particularly in Germany, citing a Copenhagen set in a circus and a Noises Off turned into a tragedy. While those sound very odd, a version of Democracy with much of the political intrigue replaced with musical numbers is undoubtedly intriguing. Young Adult writer Catherine Forde seems to be trying to keep an equally tight hold on her work. Forde, who has recently moved partly from novels to theatre, is heavily involved in a projected musical based on her popular book Fat Boy Swim. This is a deservedly well-known work that is much studied in schools. The event based on the proposed stage adaptation demonstrated that there is a ready-made audience for a production (from director Douglas Irvine of Visible Fictions and composer Michael John McCarthy), as well as showing once again that younger Book Festival attendees tend to ask much better questions than the adults. However, the project is clearly still at a very early stage, and the event dealing with the adaptation seemed more of an awareness-raising exercise than anything else. The proposed musical does have several things going for it, despite alarm bells ringing at McCarthy and (particularly) Forde’s apparent distaste for the entire genre. Certainly, any cast like the one here, featuring Christina Gordon, Claire Waugh, Paul James Corrigan and the wonderful Tyler Collins, is bound to beworth watching, and the featured songs –such asa rhythmic, Talking Heads- inflected number – promise much. No problems with unfinished work at the Festival’s final performance labelled Playing with Books, the astonishing Small Country. Burundi-born, Paris-based musician Gaël Faye’s Goncourt Prize-winning Petit Pays, translated by Sarah Ardizzone, is a story of lost innocence set during the Rwandan genocide. 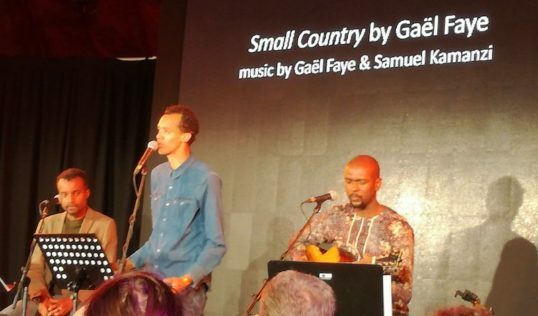 Faye and Rwandan guitarist Samuel Kamanzi have presented a version of the book mixing music and spoken word in France, and here Rwandan actor-director Kivu Ruhorahoza additionally performed some of Ardizzone’s translations to accompany Faye’s subtitled French. The occasional glitch in performance (perhaps occasioned by another of those visa-derived delays that have bedevilled the Book Festival this year) was made up for a hundredfold by the clarity and humanity of the performance. Even in such a stripped-down setting, Faye’s gently insistent French-language rapping marked him out as a genuine star, and Kamanzi’s plangent guitar and marble-and-honey vocals were utterly bewitching. Standing ovations are almost unheard of at the Book Festival, but Gina Miller’s was not the only one on Sunday night. 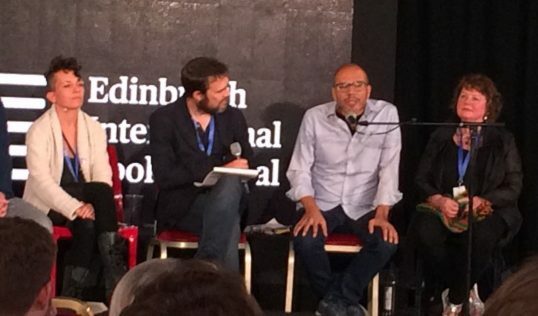 Bringing Small Country to Edinburgh was clearly a personal project for Book Festival director Nick Barley, and everyone there will be grateful for one of those once-in-a-lifetime performances. The problems in getting even internationally renowned writers into the country are probably not going to get any better in the next few months, and surely it is time to remind some people what the impulse for staging the original International Festival was. The Book Festival will return in 2019.